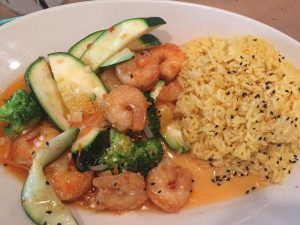 ***** DISH OF THE WEEK (Sunday- 4/15/18- Mr. Big Fish). Trust Jeff Eats when I tell you- if you’re into reasonably priced delicious seafood- Mr. Big Fish is a really good joint to know about! ***** Mr. Big Fish, 754 Neapolitan Way, Naples, Florida 34103, (239) 262-4665. Got a real good- casual, delicious reasonably priced food, separate full liquor bar, pleasant service, indoor and outdoor patio seating seafood joint for you guys to checkout- Mr. Big Fish in Naples. Jeff Eats, Mrs. Jeff Eats and another couple did a recent dinner- and like I just said, delicious reasonably priced food, pleasant service! As the reknown 20th underground sanitation expert- Ed Norton famously once said to his neighbor Ralph Kramden – “Into each life some rain must fall”- while your family and friends chow down like Mahatma Gandhi breaking a fast, you non-seafood eaters- are gonna struggle big time with Mr. Big Fish’s menu- which is real weak in the the non-fish food department! You can check menu/prices/info at gomrbigfish.com. Mr. Big Fish is open Monday-Friday 11am-9:30pm, Saturday-Sunday 3pm-9:30pm.